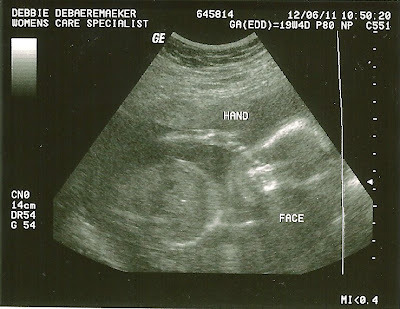 A couple weeks ago we had an ultrasound planned where we would get to find out the gender if we choose. 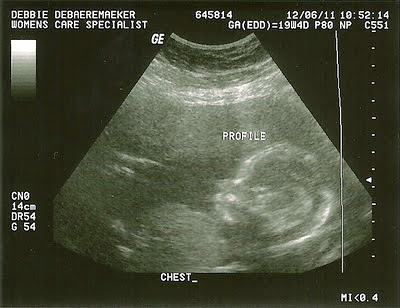 We didnt decided to find out until about a week before the ultrasound. I then had to decide how we were going to tell the parents. We actually managed to not even have them know if we knew or not. That was a bit tricky- especially when they came right out and asked us "so did you find out the gender?" I went to the baby section in my local walmart and found some cute bibs and booties to wrap to give the parents as the last Christmas presents of the day. This picture was followed by some giddy schoolgirl feet stomping with a gleeful "ohhh! now I can buy pink yarn!" So if you havent guessed- we are having a GIRL! I cant wait to get home and start pulling girly fabrics for a quilt!! Well I did the drawing and here are the winners!! Ilike to thrift shop then go out to dinner! I love to have dinner delivered to my house where I can have a nice quiet celebration with my hubby. Thanks for the opportunity to enter your great giveaway! Dave, I love your answer! For my birthday, I love more than anything to have dinner with my brothers, sisters, nephews, nieces, and my parents in San Antonio, TX. But now that I live away in North Carolina, I love to chat with them over the phone throughout the day and dinner with my hubby. Christmas lights and Birthday giveaway! Today (ok- so I posted this early- my birthday is Wendesday) is my birthday...but even better than that - its my 30th birthday. So I want to do a little giveaway. I have 3 charm packs that you can win. I will use the Random number thing to pick 3 winners! First winner gets first choice, second winner gets to choose next... etc. to Enter: Please leave a comment telling me what you like to do to celebrate your own birthday. Drawing will take place on Friday morning - giving you only a couple days to enter. I think with these I can ship internationally. Zeke has been a big help today. first he brought his rolling back pack to church and brought in his own diaper and drink etc. Our car was showing a low tire when we were heading home so Zeke helped daddy "fix it"
We came home and after Zekes nap he helped daddy sort out the laundry. By the way- my hubby is awesome to start laundry without me even knowing it took it downstairs!! And this picture just makes me laugh out loud! Zeke kept opening his mouth like he was going to bite you. I just looked in at his teeth but Dave got a tad "nervous" and so Zeke kept doing it and getting closer and closer. So my husbands work has an annual Christmas Party. Each year it has been in a different location and I think this was the best one by far. We went to the Grove Park Inn in Asheville NC where we had dinner followed by a dueling piano bar, a stay overnight and a wonderful breakfast. The Grove Park Inn hosts a gingerbread competition every year. Some of the requirements are that there must be gingerbread and everything must be editable. There was tons of gingerbread sculptures! even the youth ones were pretty amazing :) I dont think we got to see them all. Thank You very much Courtney!! We wouldnt have been able to go without you! I hope you enjoy these photos our our mini vacation. well this was not a typical day at all. but I did get some great photos! I also got a wisdom tooth removed right after these pictures were taken. Well we got back yesterday from a 5 day road trip to the coast of North Carolina. We went geocaching along the way with an average of 4-5 hours driving each day. Now- 4-5 hours is the driving part. Most of the time we were in the car at least 7-8 hours as we stopped to play and food and of course geocaching. Since getting pregnant I have not made hardly anything! I am feeling it after this long. looking a head I cannot see time to quilt until the new year- this is making me sad. I will have to try to squeeze in some time somewhere. I have a table quilt that I am hand quilting to keep me a bit more sane. I absolutely love that feeling! dont mind the non smile- I was taking this while Dave was getting Zeke ready for bed on a self timer. 10 seconds can be very long. hopefully I can get my but in gear. then we can start moving zeke into his room (out of the nursery) to make room for #2 and the whole toddler bed thing. We hope we can have both a toddler bed and the queen guest bed in the same room until I am comfortable with Zeke sleeping in the big bed. Shannon is giving away the traveling stash on Wednesday. Reading your blog posts though Google Reader is great except you cannot see the actual blog layouts. Finally, a tip for design loving blog readers: If you read blogs through Google Reader, but miss actually seeingthe blogs, this is the answer you’ve been waiting for: Logged into your Google account, go here and click on the Goodies tab. Once you “Put Reader in a Bookmark,” you will be able to read the posts from your reader, intheir actual blogs. You get to see the blog post in the pretty design, and the blogger gets the page-view. Win, win for everyone. EXCEPT it hasnt been working for me since they changed the Reader Layout! I will update this when it works again. EDIT: it works again!! yay! I have blogged this so I have the info handy for when i need to do it again. So- How do/ did you deal with Halloween candy? did your kids get to keep it all? did you divide it between everyone? did you sneak candy from your kids? Here is what my parents did with us growing up. There were 4 of us kids bringing in candy for a few years. After we got home mom and dad would dump all the candy in the middle of the table. It would all be sorted out by type of candy- gum in a bowl, chocolate in another, chips in another etc etc. We would then be allowed to take some - I think 10?) pieces each. The rest of the candy would be put up on a shelf and every day mom would let us pick out 2-3 pieces to add to our lunch boxes. Sometimes we would get some after school, a special treat etc. This was a fair way to deal with it, especially once me and my brother stopped trick or treating. The haul would often last well past the first week- usually lasting the whole month of November. As you can see in that picture above, I have already sorted out the candy into groups and they are now in a couple bowls. I think I may continue what we did with mom and dad- but we will see. so- what do you do? Wow- it has been a long time since I posted! Daves parents and Mine have both been up for Zekes birthday. I will blog their visits later. For now I will blog about the Renaissance Fair that we went to in Huntersville NC. It was the first time any of us have gone to a Renaissance Fair, ever. There were soo many stages to see shows on. you could spend the whole day there and not see everything~! The bonus of us going this past Saturday is that it was the Halloween day. They encouraged kids to dress up and go trick or treating at all the booths! I did most of it for Zeke- BUT after lunch I let Zeke out of the stroller and let him run into the booths to say Trick or Treat. he would often only get out "TREAT". He would say "TREAT" to anyone in the booth to get the candy. We did have a little problem of him wanting to open the candy right away- but we told him he had to sit in the stroller to eat his candy- it was much more fun to run to all the booths! Here is some pictures from the day- Enjoy. Leo has been with us for almost a month. We have enjoyed his company. He is a laugh and a half even though he can get into trouble! Dave's moms quilt is done. Saturday was Zeke's 2nd Birthday!! The cake- Thomas of course!